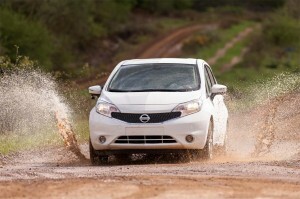 A Nissan Note shows how the water and oil-resistant coating keeps one side of the vehicle clean. If it’s not winter’s salt and grime, it’s mud and everyday dirt. Keeping your car clean can be a chore – a backbreaking one if you prefer to do it yourself. 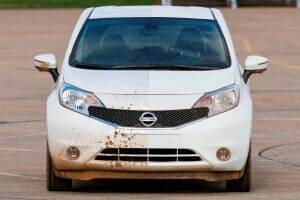 But Nissan is testing a car that can keep itself clean, thanks to special paints that repel water and oils. Similar technology could eventually allow manufacturers to do away with windshield wipers by effectively fend off water and grime. Meanwhile, new coatings can also help keep a car’s interior cleaner, something especially useful for parents – or those actively involved in sports like camping and trail biking. The Nissan Technical Center in Rolle, Switzerland is in the midst of testing a specially prepared version of the maker’s little European Note model. The subcompact hatchback has had a layer of a special coating, called Ultra-Ever Dry applied over its conventional paint finish. Developed by UltraTech International, it’s technically known as a super-hydrophobic and oleophobic paint. In other words, it actually repels both oil and water. 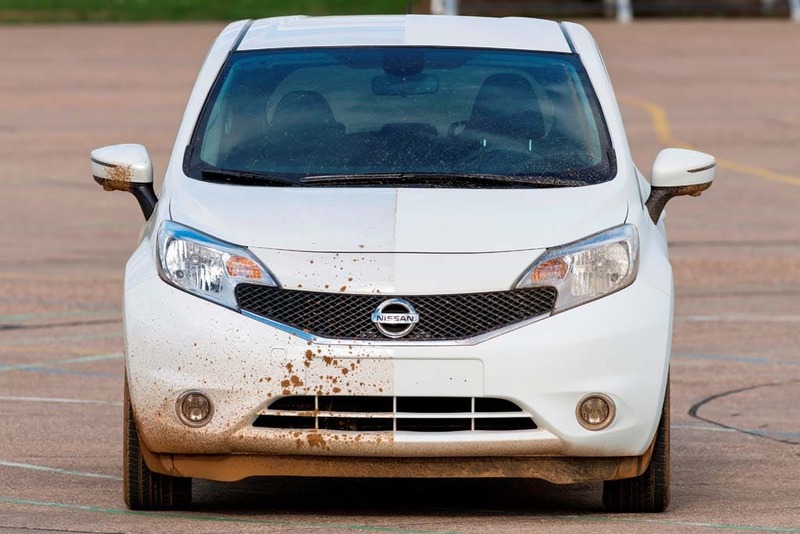 The Nissan Note takes a mud bath. That means that most common dirt, grime and oil won’t stick to the vehicle’s sheet metal. 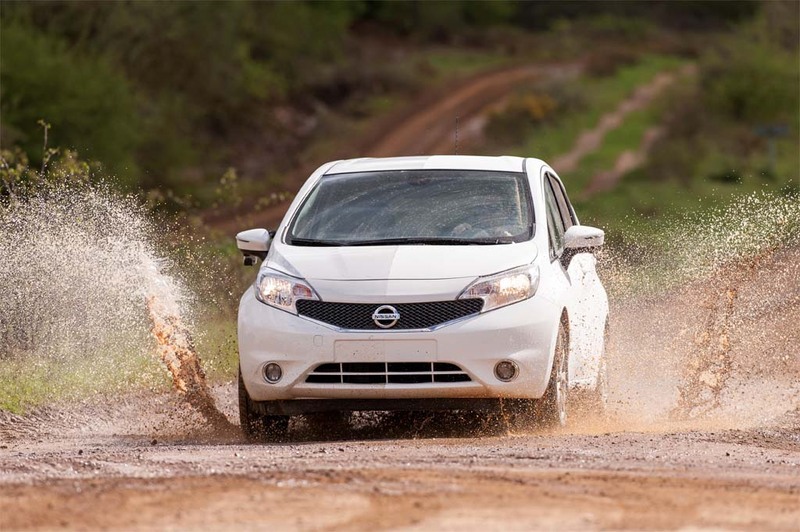 The Ultra-Ever Dry finish even works with rain, frost and sleet, Nissan reports, after preliminary testing. The maker did come up with another interesting paint technology a few years back, a self-healing paint. Dubbed Scratch Shield, it uses an elastic resin mixed into a conventional paint formulation that, when exposed to sunlight, would fill in small scratches within a matter of hours. Unfortunately, few motorists have been willing to pay the premium for the special formulations and Nissan now offers Scratch Shield in only a few markets – not including the U.S.. The Japanese maker isn’t the only one looking at hydrophobic coatings – which could prove an interesting alternative for keeping windshields clear and clean. Italian design house Pininfarina recently rolled out its wiper-less Hidra concept vehicle, which relies on both aerodynamic design to minimize what actually comes close to the windshield – and a special coating designed to keep things from sticking if they do come into contact with the glass. Six-year-old Urwah Khan, sitting in the "puke zone," helps GM researcher Matt Gohlke. Under a hydrophobic outer coat, a second, nano layer “pushes” dirt off to the sides, while a third layer essentially helps clean off grime. An additional, electrically conductive layer provides the power needed to make it all work. Pininfarina designers claim the technology behind the Hidra wiper-less windshield could prove reasonably cost-competitive and could wind up in production in a few year, marking the most significant improvement in rain gear since the first hand-operated wipers were introduced more than a century ago. British sports carmaker McLaren, meanwhile, has lifted a page from fighter jet construction, it is experimenting with a system that uses high-frequency sound waves to create a sonic barrier to prevent water and dirt from reaching the windshield. Cleanliness is only one reason why makers would like to eliminate the windshield wiper. The devices also create plenty of aerodynamic drag which reduces a vehicle’s fuel economy. Manufacturers also are looking at ways to keep things clean inside their vehicles. Most fabrics are now treated with dirt and liquid-resistant coatings – or can be ordered with an optional treatment package. Ford says it also tries to design vehicles so it’s easy to wipe or vacuum food or spilled beverages out of cracks and crevices. And to that effect, the new Honda Odyssey minivan this year began offering an optional, built-in vacuum cleaner tucked into its rear cargo compartment. Of course, one challenge is to prevent messes in the first place, says General Motors, which has been conducting research on ways to keep passengers, especially children stuck in back rows known to industry engineers as “the puke zone,” from getting car sick. Among other things, the research has shown GM engineers that passengers are less likely to get sick when DVD screens are mounted overhead. This entry was posted on Friday, April 25th, 2014 at and is filed under Automobiles. You can follow any responses to this entry through the RSS 2.0 feed. Both comments and pings are currently closed.